Khopra Danda (Ridge) Trek also known as Khayer Lake Trekking is one of the most impressively attractive untouched nature and freshly opened territory for trekking sport in Annapurna. This trek is seemly good for all opinioned trekkers. Parts of this trail are more strenuous while other parts are easier. The path goes through deeply lush thick pine, oak, rhododendron and bamboo forest with gorgeous vistas, journey through beautiful Magar, Gurung, Kami, Damai and Kshetri - Brahmin villages with its beautifully terraced farm lands. This Khopra Danda Trek can be done as a special combined tour and adventure hike up to Khayar Lake 4827m, the highest point, the most spectacular, picturesque and breath-taking views of snowcapped peaks and mesmerizing landscapes! On this trip you will have chances to observe real Nepali life styles (their culture, art of living and religion), stay together with the family at home stay, that's why you have chances to share experiences with the families, hiking in the lush pristine forest with great vistas and the best place being far away of crowd and hectic boring life. Other thing about this trail is; very few tourist you see on the way, so it’s quiet and peace trail also. Mountains views are just awesome 180 degree from Dhaulagiri 8167m, Annapurna I 8091m, Manaslu 8163m etc. + green high hills, rhododendron forest and the southern green slopes with terraced farming lands. Khopra Trek or South of Annapurna region is one of Nepal’s last Himalayan jewels; a glittering array of panoramas, gigantic peaks and peaceful nature awaits the adventurous explorer. However, as magnificent as the mountains are, it is perhaps the people of Nepal that are its greatest asset. Khopra Danda trek is the diversity of ethno-culture, colorful festivals, temples and gompas, mixture settlement of friendly loving people. On this trip you will have chances to mix with those people and observe their lifestyle, culture and traditions. These things make this trip one of the finest. Wake up early morning to enjoy an amazing sunrise over Dhaulagiri and the Annapurnas. Descend through pastoral villages on your way down to Tatopani. Day 05: Trek Dobato (3350m) 5-6 hours walk. Stay overnight lodge. Day 06: Trek to Chistibung (3000m). 4-5 hours walk. Overnight in lodge. Day 09: Khopra Danda – Narchyang/1200m. Stay overnight in community lodge. Day 11: Drive to Pokhara and stay overnight in hotel. Day 12: Drive to Kathmandu by tourist coach. Transfer in Hotel. Day 01 :Fly or drive to Pokhara (800m), Overnight in Hotel Fly or drive from Kathmandu to Pokhara in the morning with scenic mountain views including Langtang, Ganesh Himal, Manaslu and Annapurna Massif. Once we reach in Pokhara, we can visit such as interesting places like Devi’s fall, Gupteshwor Cave, Temple Barahi and boating on Phewa Lake in Pokhara. Stay overnight at Hotel. Day 02 :Drive from Pokhara to Kande and trek to Pitam Deurali (2100m), Overnight in Lodge From Pokhara you will be transferred by road (private bus) to the starting point of the trek at Kande. We stop to stretch your legs while the porters organize the load, you will set off on the walk. About one and half hours walk up takes us at Australian Camp, a beautiful place now you will have spectacular views of Annapurna South (7219m), Hiunchuli (6441m), Machapuchhare (6993m), and Hiunchuli (6434m).We continue our trek through via Pothana to Pitam Deurali nestled in the peaceful and tranquil jungle pass. Day 03 :Trek to Ghandruk (1940m) 6-7 hours walking.Overnight in Lodge Today, we walk to Ghandruk inhabited by the Chettris and Brahmins. 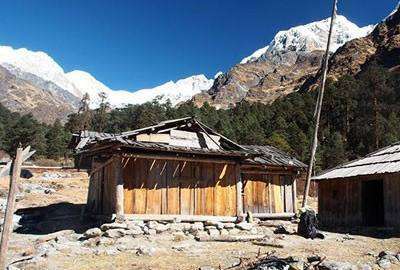 Soon you will reach Tolka and then Landruk beautiful hamlet of Gurung Village, after having lunch at Landruk descend down Modi Khola then walk up to Ghandruk. The trail now climbs up steeply up stone steps. After about 2 hours walk from the lunch place we get to Ghandruk, is one of the biggest Gurung villages in the area, the difference in the Gurungs lifestyle here to that of their neighbors in the lower areas is very apparent. Ghandruk is well known for the number of its men folk who have served in the British Gurkha regiments. From the lodge at Old Ghandruk, you will have spectacular views of Annapurna South (7219m), Hiunchuli (6441m), Machapuchare (6993m), and Hiunchuli (6434m). Day 04 :Trek from Ghandruk to Tadapani (2610m) 4-5 hour walking. Overnight in Lodge Another day ascending ahead, but the walk will be easier now that you’ve found your trekking legs! Leaving the terraced hillsides and the village of Ghandruk behind, you will enter oak and rhododendron forest. This is a particularly pretty part of the walk, the forest is alive with the sound of birds and small tumbling waterfalls, and if you visit in spring, (late March to April) the rhododendron will be in full bloom. There are no villages on today’s route, but there will be a few teahouses at Baisi Kharkha, providing welcome drinks and a place to rest. There will be fine views of Annapurna II (7937m), Annapurna III (7555m), Annapurna IV (7525m), Annapurna South (7237m), Machhapuchhare (6993m) and Lamjung Himal (6931m) along the way. Your lodge at Tadapani is the perfect setting for sunset and sunrise views. Day 05 :Trek Dobato (3350m) 5-6 hours walk. Stay overnight lodge. Trek from Tadapani to Bayli Kharka You will leave the main trail that leads to Ghorepani today and follow a rarely used trail - initially through thick rhododendron forest - that leads to local water buffalo pastures. The climb is gradual and soon you will emerge above the tree line to superb views of the Annapurna range. You will take lunch by a small stream and then continue to climb gradually though open countryside to reach a small pass, where the trail descends through rhododendron to an open clearing known as Bayli Kharka, and the lodge. From the lodge there are great views of Dhaulagiri Himal. Day 06 :Trek to Chistibung (3000m). 4-5 hours walk. Overnight in lodge. Trek from Bayli to Upper Chistibung This morning you will descend through open ground and forest to reach the pastures of Lower Chistibung, where you will have lunch. After lunch you will continue to walk through forest, ascending gradually and passing through several buffalo grazing pastures to reach a clearing and temporary herder’s settlement at Upper Chistibung, where you will stay in the small community lodge. For the next week you will stay in lodges run by the local communities. We have contributed to the construction of these lodges, part of a series of projects to designed to aid the local community. Being off the beaten track, the villages haven’t previously enjoyed the benefits of tourism. Now with the network of our Community Lodges, there are profits to benefit local projects and schools. Day 08 :Excursion to Khair Lake (4728m) It is a very good idea to stay here at least two days; you can take a beautiful day’s hiking trip to Khayar Lake at the altitude of 4728m. This, however, is not recommended for every trekker, because it is a very long way to trek to the lake and come back the same way to Khopra. It takes a minimum of 7 to 8 hours as a round trip. But it is good idea to go as far as Thanti (around 4200m. high) and come back. At Thanti, there are some shelters for yak herders and shepherds to stay in during the monsoon. Khayar Lake is very famous for Hindu belief; on the occasion of Janai Purnima , around the full moon of Saaun (July-August) the high caste men, Brahmin and Kshetri , must change the janai, which they wear looped over their left shoulder. So Janai Purnima brings crowds of pilgrims to this sacred Khayar Lake and many pilgrims come from India as well. There they garland a statue of Shiva and throw coins at a temple and into the lake. There are two places to make pooja, seven minutes before this lake and a temple, where hundreds of sheep and goats are sacrificed on the same occasion. The pilgrims sleep one or two nights at Thanti, where the yak herders’ shelters are used to sleep in, but those are not enough for all these people. They bring large tents and set them up as shelter for many people and then they go up to the lake, making pooja, and it would be fantastic to take the Khayar lake trip. The views of nature’s beauty are mesmerizing!! Day 09 :Khopra Danda – Narchyang/1200m. Stay overnight in community lodge. Trek down to Narchyang Village at the elevation of 1200m, Narchyang is the biggest Magar village in the area. Overnight stay in homestay or in the lodges. Day 10 :Trek to Tatopani Today it is short walk to Tatopani, about 2-4 hours only. Here we enjoy natural hot spa after the body ache and leg sore trekking. Rest and relax. Overnight in lodge. Day 12 :Drive to Kathmandu by tourist coach. Transfer in Hotel. One experienced licensed local trekking guide. Assistant guide to walk with group to support where necessary as per the group size. Meal: 12 Breakfasts, 9 Lunches and 9 Dinners during the trek. All necessary Trekking permits and Conservation entrance fees. All local tax, vat and office service charge. Tips and gratitude for guide and porters (Tipping is not manditory but expected by guide and porters). An article for "Tipping and Graditute in Nepal"